For some folks two strokes are all it takes. 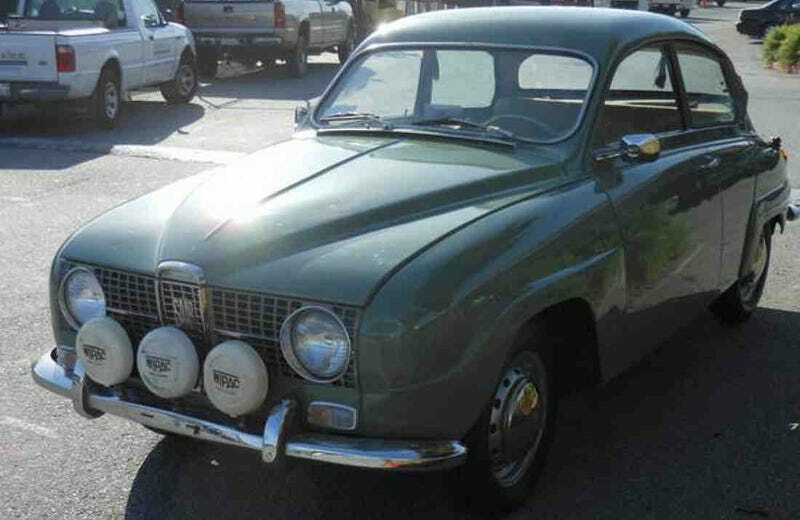 Today’s Nice Price or Crack Pipe Saab 96 is a rare 2-stroke and that in itself may be pretty exciting, just as long as its price doesn’t prove anticlimactic. You know, here in America we don’t kitten to people pointing out our deficiencies. Instead we prefer to focus on the positives and go on like nothing bad ever happens. Except of course to foreigners- and then that’s what they get for being foreigners. It’s has thus been ordained. Apparently 62% of you didn’t get that memo and hence sent America incarnate - meaning yesterday’s 1983 Chevrolet Corvette convertible Indy Pace car tribute band - down in a Crack Pipe loss. You know, like a rock. I don’t want to say that the loss was an even bigger rebuke of the orthodoxy than the one taking place in Egypt right now, but it was. One of the things that was a rocket’s red glaring issue with that star spangled Vette was the admission in the ad that the big beast burned oil. The ad for today’s 1966 Saab 96 notes that this bubble-shaped Swede does as well, but in this case, that should prove to be a factor in its favor. Saabs once were great. The marque’s earliest offerings were created by people who had never actually seen a car before, instead having been locked in an secretive underground lair where they masterminded the designs of aircraft. As a result, those initial Saabs were imbued with aerodynamic considerations and construction techniques that were pretty much unavailable from any other marque. The 96 is a derivation of the 93, which itself was a direct decedent of the original 92, Saab’s first production model. As a 1966 model this one is of the long-nose variety, a change that had been introduced the previous year. The bigger schnoz allowed for the move of the radiator from above and behind the engine - where it cleverly also served as the cabin heater core - to in front. The longer nose was added to make room for a new, larger engine, which eventually turned out to be Ford’s Taunus V4. This one however has the 841-cc two-stroke triple, an engine which, should you not be familiar, can sound absolutely dope. Saab’s little oil burners helped power Erik Carlsson to rally victories around the globe, and established the 96 as a tough and reliable little car. In 1966 the engine put out 46-bhp with its triple bore Solex setup. The center bore is only used for starting and idle, while the outer two serve higher rev duty. The two stroke requires pre-mix, just like your gardener’s weedwacker, and the proper ratio of gas to oil is pretty crucial to its proper running. Of course, how awesome a party conversation starter would that discussion be? Behind the tiny terror is a manual gearbox, and I think by ’66 these had all-syncho 4-speeds rather than the three-on-the-tree double-clutch into first boxes of the earliest cars. One thing that’s pretty certain is that owing to the unique lubrication requirements of the two stroke mill, the clutch is more freewheeling than a dilettante heiress. 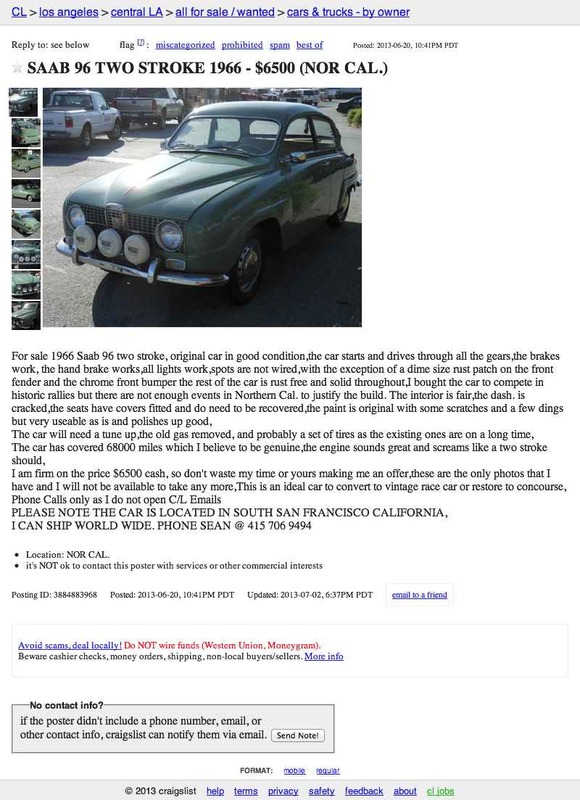 It's claimed in the ad that the current owner originally bought the car with the intent of vintage rally participation. It currently has a nice set of triple torches mounted to the front bumper, but it seems that's as far as he got. The rest of the car looks pretty tidy, albeit with a few dings and scratches to the otherwise shiny shiny seafoam green paint. The ad further notes that the interior is kind of eff’d up, with cracks in the good-luck-finding-that dash cap, and seat covers over upholstery you probably don’t want to see. He shrewdly doesn’t provide any interior pics. There are other issues with the car, mostly owing to its having languished for some time. That means the gas is old, as are the tires. What else might let loose on a maiden voyage is open to speculation so a thorough pre-flight inspection is warranted. Other than that, this seems to be one of the nicest examples of two-stroke 96s for sale today, and owing to the Internet, for the past few months. Of course, should you not want to deal with refueling requiring a trip to the gas station and garden center, then perhaps this sweet V4 edition might coat your stoat. For me however, it’s two stokes and I’m done. That means that this Saab is a serious contender in my book, and now it’s time to see if it is in any of yours as well. The seller says he is firm on his price - which is $6,500 - and good to his word, he hasn’t dropped it in months despite having had the car up for sale so long that paint might actually be moss. What do you think, is this bee-engined Saab’s $6,500 price the bee's knees? Or, is this a case where oil and oughta don’t mix?